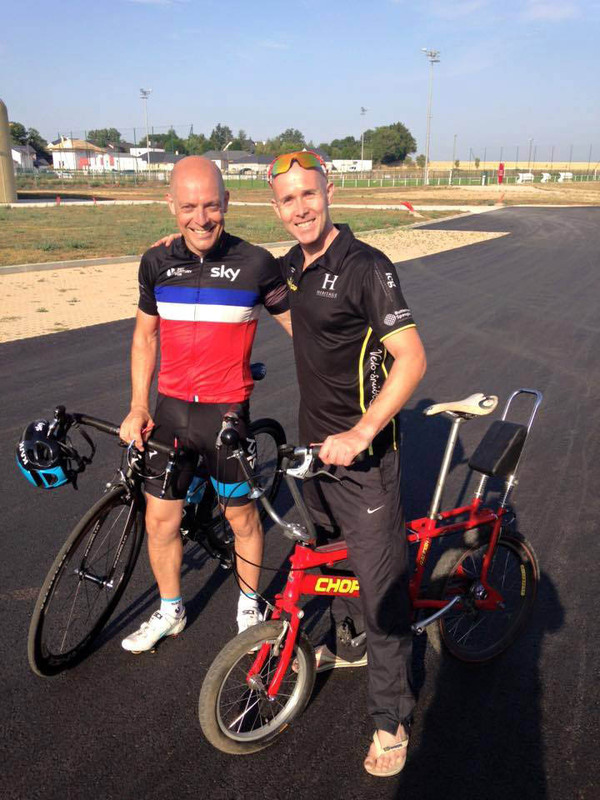 A Raleigh Chopper enthusiast is taking his retro bike for a spin this Saturday… up Alpe d’Huez in an Everesting quest. Dave Sims has only been back in the UK a little over four weeks after completing the Tour de France on the 1970s icon but he has quickly grown bored. To satisfy his ambitious thirst for endurance and mad challenges, Sims is tackling the Alpe over an estimated 18 hours to become only the third recorded person to climb an accumulated total of 8,858 metres of the mountain pass consecutively. During his Tour climb in July he explained how three of his friends on road bikes rode the 21 hairpin bends with him – but Sims and his Chopper were too quick. His fond memories, he hopes, will be conducive to a successful Everesting this weekend. “I know the climb well and I did it in 1.15 during the Tour with my friends holding me back!” he told Cycling Weekly. He is breaking his ride on the yellow chopper down into three segments to make the mental challenge more simple to compute. Forever the optimist, the 36-year-old added, “It’s only one day, no matter how bad it gets. It makes it seem so much easier. “[Bradley] Wiggins said in the Hour Record that you get the first half-an-hour free and then after that it starts to get to you and the legs drain. That’s going to be my approach also – the first half is the easiest. Speaking on a break from riding his mountain bike, a few hours before jetting off to France, the Help for Heroes fundraiser’s fitness going into the colossal challenge is not at its peak. Yet he may even go for another record, energy-permitting. “I’ve lost a bit of fitness but did I finish my Tour ride on July 25. “Since then I’ve been doing interviews and just riding locally without power meters or heart rate monitors. “I’ve enjoyed riding organically but also missed the routine of training for a goal. “My form wasn’t going to last forever unless I was riding up mountains every day and there aren’t many of them in Southport! “Apparently [neither Dave or CW were able to verify this] the record for the most ascents in 24 hours up the climb is 11. “My team mates are saying that it’s only two more so I may as well go for the record. You can keep up to date with the Everesting attempt on Sims’ Twitter profile this weekend which will be updated hourly.